Next in the series on Timberline Smokehouse is this Sweet Bourbon & Honey Pepper variety of beef jerky. See my previous reviews of their Original, Beer & Garlic, and Sweet Mountain BBQ varieties. Timberline Smokehouse is a brand of Timberline Smokehouse, Inc., based out of Johnstown, PA. The company was founded by Adam Thomas in 2008. Thomas also runs Thomas Smoked Meats, a store also located in Johnstown, PA where he sells his line of meats, steaks, chops, sausages, as well as jerky. Timberline Smokehouse is his national brand, whereas the smoked meat shop is focused at local shoppers. This Sweet Bourbon & Honey Pepper is said to have been marinated in Kentucky Bourbon and honey. Beef, sugar, honey, salt, modified potato starch, worcestershire sauce powder, hydrolyzed vegetable protein, vinegar powder, dehydrated garlic, dehydrated vinegar, straight kentucky bourbon whiskey, sodium nitrite. The first thing I taste from the surface of these pieces is a smoky flavor. Several seconds of sucking, and there's a light saltiness, with the black pepper making a light showing as well. Overall, a light surface flavor. The chewing texture starts with some natural meat flavors, a stronger black pepper flavor, a bit more saltiness, and light bit of sweet. For being advertised as "Sweet Bourbon & Honey Pepper", the only part that seems to come out with any strength is the black pepper. The sweet is noticeable, but I'd have to call it light, let alone the unique flavor of honey is difficult to separate from the sweet. As for the bourbon part, I was able to detect some flavor in the more moist pieces that had the same bite, and wood-barrel flavor of whiskey, but it was very brief. It shows up as a faint tangy flavor contrasting against the meat flavor. 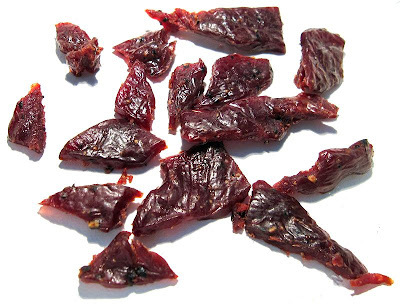 But not all pieces provide this flavor, I'm reviewing a sample of jerky that I was told was very fresh, but it's still quite difficult to identify the bourbon flavor. 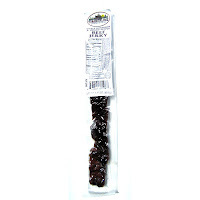 Overall, the flavor that seems to provide most of the flavor in this jerky is the black pepper, which is noticeable somewhat on the surface of these pieces, but much more so in the chewing. After eating several pieces, I'm feeling a good aftertaste back there. The natural meat flavors are noticeable in this, with enough strength to enjoy if you're just snacking away let alone analyzing carefully as I am right now. It has a light smokiness. The saltiness seems to be at a light-to-moderate level. What you're going to notice in this jerky is largely a strong black pepper flavor and a fair amount of natural meat flavors. You'll notice a light sweet that adds some body to the flavor. The bourbon flavor seems to raise it's head in the more moist pieces, but is light, and if you're not paying attention you'll miss it. These are chunks of whole meat, sliced thick, and in small pieces. 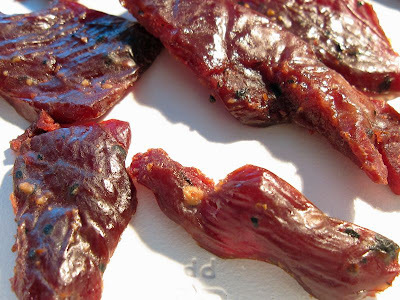 This is a moist jerky, with quite a bit of oil on the surface. The bite-sized pieces means not having to bite off chunks, and spares your fingers from getting too oily. Chewing seems to vary between easy and somewhat easy, depending on how moist each piece is. The chewing texture starts out feeling moist, and a little stiff with some rubbery chewing resistance initially. With some sucking and light biting, it chews down to a soft mass in about 15-20 seconds. At that point, it feels just like eating a steak, comparable to one cooked medium. In terms of fat content, most of this jerky looks to be pretty lean, however I did find one larger piece of meat in another package that had a lot of fat. Several of these pieces contained some unchewable wads of tissue, and/or stringy sinews, while others were all meat. I found one piece with a chunk of crunchy gristle. Handling this jerky can get messy, with every piece leaving a fair amount of oil on my fingertips, while some have a lot of oil. Timberline Smokehouse sells this Sweet Bourbon & Honey Pepper variety at a price of $9.00 for three 1.75oz packages. If you spend more than $25.00, the shipping is free. I bought $36.00 worth, encompassing several of their varieties. That works out to a price of $1.71 per ounce. For general jerky snacking purposes, at the $1.71 price per ounce, this seems to provide a good value. I'm getting a good deal of snackability for its good overall flavor, steak-like chewing texture and its moist, easy eating. That price is actually the same as what you'll pay for mass-market jerky from the grocery store, but yet I think you'll get far more snackability with this. As a "Sweet Bourbon & Honey Pepper" variety, at the same $1.71 price per ounce, it seems to provide a decent value. It's largely the pepper part where this jerky delivers its value, and I do taste a light sweet. The bourbon flavor is difficult to find, and is only found in the very moist pieces for a little bit. I found this Sweet Bourbon & Honey Pepper variety from Timberline Smokehouse to provide a good overall flavor, even though I couldn't really get much of any bourbon flavor. The bourbon is the marquee ingredient that Timberline Smokehouse emphasizes when marketing this jerky, but yet is the one flavor I taste the least of. Still, on its own merits, it's quite enjoyable. It's largely the pepper flavor I tasted with a fair amount of natural meat flavors, and a light sweet. Add to that a moist meat consistency, where most of the pieces were easy to chew, with a handful being requiring some effort. Once I got a piece chewed down a soft mass, it felt like eating a real piece of steak. I felt it lacked enough "pop" to get it up to a best rating. Perhaps getting more bourbon flavor into this would be enough, though I imagine bourbon is a pretty expensive ingredient. Otherwise, I see this jerky as just two flavors, black pepper and the natural meat flavors, with a bit of sweet in the background. My recommended beer pairing for this, go with a porter.